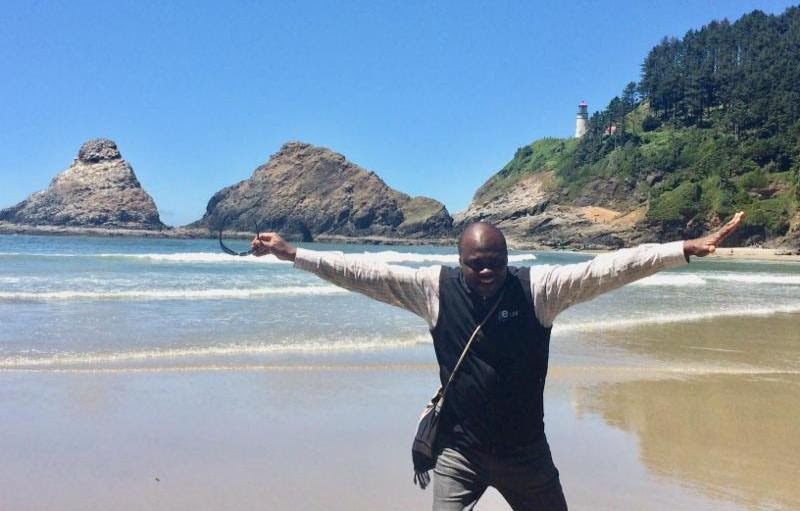 ELAW Fellow Brice Séverin Pongui spent Saturday at the Oregon Coast. This photo was taken on the beach, near Heceta Head Lighthouse. Please extend a warm welcome to ELAW Fellow Brice Severin Pongui who arrived from Congo-Brazzaville on Thursday. Brice is Executive Director of Institut Cerveau Vert 2063, a leading non-profit organization in Central Africa. Brice says Institut Cerveau Vert (Green Brain Institute) seeks a prosperous Africa, based on good governance, respect for human rights, justice, and the rule of law -- by 2063. "We want a peaceful and secure Africa, with people-centered development that realizes the potential of women and youth," says Brice. Brice will be in Eugene for 10 weeks to work one-on-one with ELAW staff attorneys and staff scientists, build the capacity of his organization, and study English at the University of Oregon's American English Institute (AEI). Many thanks to AEI for providing Brice with a Director's Distinction Scholarship for the Intensive English Program.